Before I even begin, I’ll talk about myself. I’ve been an overthinker for as long as I can remember. It developed overtime due to my past and I’ve been fighting it ever since. I’ve gotten much better with time because it was only damaging my life and my relationships. The first step to recovery is actually admitting the problem and accepting it as a whole. You need to stop telling yourself that it’s okay to overthink, because it’s not. 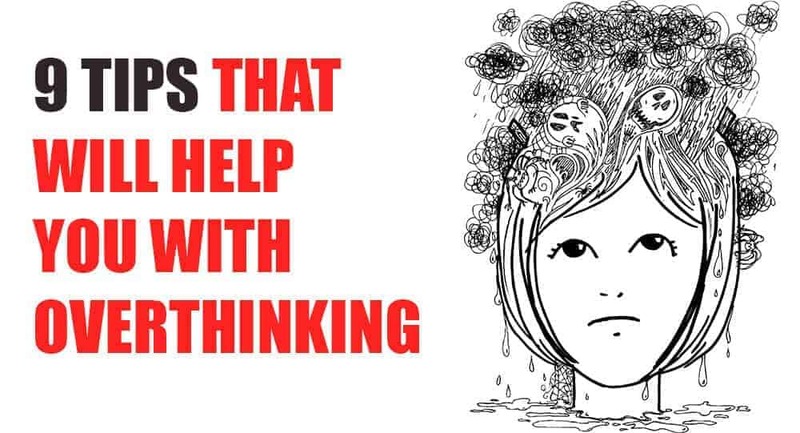 And you also need to establish it very clearly in your mind that overthinking is bad and harmful for you and it can damage you and the people around you. When one small thought crosses your mind, you’re going to take it to another thought and you’ll pretty soon find yourself in a maze of thoughts and you wouldn’t know where to stop – I call this the "Limbo of Thoughts" and we all have been there at least once in our lives. Your mind is the most powerful part of you, it is what defines you and shapes you into who you are, it is what develops your personality and the way you are perceived by people, your mind is your control centre and you can’t overuse it and heat it up by overthinking. Go easy on your mind. Whenever a negative thought starts coming up in your head, fight it with all of the happy moments you can think of. Just don’t let that first dark thought come to fruition. I’ve tried meditation and it has done wonders for me! Meditation seriously helps take the edge off and focus on the positive energies of life. Be by yourself, in any space that’s comfortable for you, and meditate. Take long and deep breaths, release all of the negativity in your mind and ONLY focus on the positives. Life’s too short to focus on the negatives. If you have difficulty meditating by yourself, there are plenty of good meditation centres all over the world with good coaches who teach in classes. There’s always help in the world for those who need it. People tend to overthink more when they’re alone and doing nothing. If you have a habit of overthinking, try not to just sit around and left alone to your thoughts. Involve your mind in something or the other. If you have to think, think about work, think about that one project that you need to finish, just keep yourself focused on the things that actually matter and need to be done. Keep yourself busy with family, if you sit alone for too long it’s not good for you. Keep yourself surrounded with the people you love, the people who care for you and have positive energies to share with you. The key here is to occupy yourself with anything positive. This is a continuation of my last point. Our friends are a big part of our personality and growth, they play a huge role in what we are and who we become in life, through their gestures and memories. You may become an overthinker if one of your friends already is, because we adapt a lot of things from our friends involuntarily. Now I’m not saying that you leave that friend, I’m saying try talking to that friend and fix the problem they’re having. I repeat, keep a healthy circle of friends. And if you have a friend who’s nothing but negative all the time, talking isn’t going to work there. It always hurts when friendships end but some friendships are actually damaging for you and it’s better to leave them. Patience is one of the best virtues out there and it’s always one of the most difficult ones to attain. Try being patient with situations, try being patient with people. If you suspect someone doing something wrong to you behind your back, instead of thinking about it just be patient. Whatever they did will automatically come to you one way or the other. Have faith and be patient. We all have to sooner or later accept the harsh realities of life, no matter how much we try and run away from them or tell ourselves otherwise. You need to accept the fact that there are some things that you just cannot change no matter how hard you try changing them, so it’s much better if you tell yourself the truth instead of lying to yourself and putting yourself in danger. Be okay with the things you can’t change and embrace the things that naturally come to you. It’s always better to let things out in front of someone you trust. We all have that one friend, our confidant, who we share everything with without the fear of being judged. It is much better than overthinking when you talk about your problems with your confidant. If you have something to talk about, let it all out in the comments below. I reply to almost every comment I read. And as always, stay blessed and keep the love alive!